Selling a home in todays market requires several steps in the marketing process. One of the most important steps is having your home show ready! Once the task is accomplished, how your home is displayed to the public can make a difference whether your home is shown or not. In the not so distant past, putting a home on the Indianapolis MLS and having Open Houses could guarantee some traffic. Today, many of the buyers who contact me, already have a list of homes they want to see. Recent statistics suggest over 80% of homebuyers start their search online. As gas prices rise, we may see the percentage of online buyers rise also. Having an online presence is no longer an option and your online presence must present your home in it's best light. Imagine for a moment you are a buyer, searching online for homes. You certainly do not want to spend all day looking at homes which do not meet your criteria. You search diligently and save the homes which most interest you. With so many available, you choose wisely which are tops on your list. What do buyers look for? Pictures! Online tours! Just this week, I had buyers from out-of-state call me to show them homes. Since they don’t live here, they don’t know exactly which homes or area of town will best suit them. They sent me a list of twelve homes they wanted to see. What did these twelve homes have in common? Pictures! They all had the maximum of 10 pictures allowed by our local MLS. Even the best description will not make up for the lack of pictures. The above chart was created with data from Point2Agent. Paula- I'm amazed how many houses I see listed that have no photos or poorly done photos when it is so critical to getting a house sold. This is a great article just full of great information. I especially like the statistical data. Hmm..I'll have to look to see if I can figure out how to put together a chart like that. Thanks. Jennifer - Thank You! It is truly amazing! 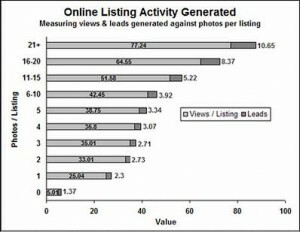 With 80%+ of the homebuyers initially searching online - good pictures are a must. My clients will overlook homes without pictures. Let me know if you get a chart made - I like charts - so do my clients!